I came to be an antiquarian bookseller partially by accident and originally in a part time capacity in 1983. In that year my business, The Newport Book Store was founded in Newport, Rhode Island. In 2015, I transitioned the business to Donald Magee, Fine and Rare Books focusing on internet sales, appraisals and book collection advice. My previous work experience included some high school teaching, work as an economist with the Bureau of Labor Statistics, and the balance as an economics and history professor at several colleges and universities. I have created a quantitative de-accession model, which had been used by libraries and individual collectors. This model combines the rare bookman’s view of what makes a book important or not, with the often-differing librarian’s view of value. It has been used for deciding what titles should go into special collections, be repaired, or be “weeded” from the library or collection. In 1987 with a former associate’s assistance I was responsible for the identification, evaluation and verification – that is- the “discovery” of an original copy of the Declaration of Independence in the Town Hall of Portsmouth, RI. It is only the 7th known RI copy and the only one still owned by the town to which it was issued. It was printed in Newport, July 13, 1776 by Solomon Southwick. It was restored in Washington, D.C. and resides in the town vault. I belong to many community and book related organizations. 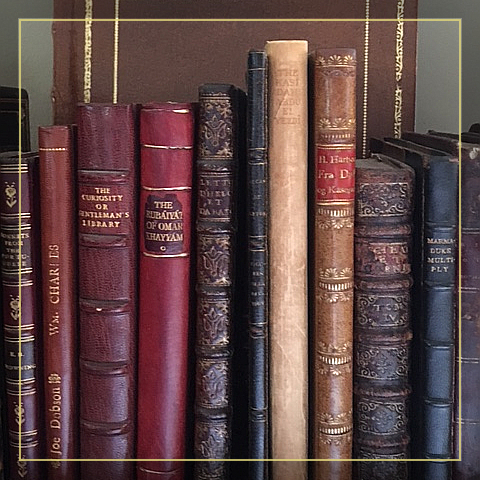 I am a member of the Antiquarian Booksellers Association of America (ABAA), the Grolier Club of New York, the Southern New England Antiquarian Booksellers, the Redwood Library and Athenaeum, and the John Russell Bartlett Society. My own book collection consists of old or original classics of economics, fine and signed bindings, books on sports car marques I have owned or raced (mostly British), and a large collection on the Middle-East, especially the Arabian Gulf. I became interested in Arabia while researching my thesis. I have traveled in the region and have become conversant in Arabic. To have an economically viable business in today’s book-selling world, one must keep abreast of non-book issues such as trends in marketing, consumer behavior and macro-economic factors, as well as a solid understanding of history. Otherwise we are caught in a type of “future shock” as with the changes occurring in bookselling because of the introduction of the “electronic” book and marketing changes related to the Internet. Antiquarian bookselling is one of the last of the nineteenth century professions that still survives in the twenty first century and it does so because of its multi-disciplined professionals.